Home / News & Blog / How does Jazz Appreciation Month sound at Turner Sims? April is Jazz Appreciation Month – here’s to 30 days of celebrating music we love, culminating in International Jazz Day (IJD) at the end of the month. Introduced by the UNESCO in 2011, with the aim to draw attention to the genre and its ambassadorial qualities, IJD is an annual celebration uniting communities, artists and jazz enthusiasts all over the world. There’s more jazz than ‘just’ music – in the words of the IJD organisers: ‘this international art form is recognized for promoting peace, dialogue among cultures, diversity, and respect for human rights and human dignity; eradicating discrimination; promoting freedom of expression; fostering gender equality; and reinforcing the role of youth in enacting social change‘. 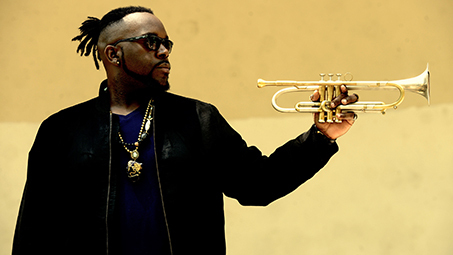 Celebrate the event in style at Turner Sims, as we welcome Chicago’s renowned musician, composer and bandleader Marquis Hill on Tuesday 30 April. Hill hones a warm, mellifluous tone on trumpet and flugelhorn, building upon his distinctive sound to craft arresting originals that embrace post-bop, hiphop, R&B and spoken word. Of course, the best way to discover new sounds would be through the ears and minds of the musicians themselves, so we asked our Spring Season jazz artists to suggest tunes for a playlist. Spoiler alert: there’s not only jazz in this playlist! Keep reading in order find out who chose who … you might be surprised. Feel free to let us know which artists inspire you this month. We’re at @TurnerSims on social media and we’d love to hear from you. Enjoy the music! John Etheridge: I was absolutely riveted when I first heard the tracks In a silent way and It’s about that time from the Miles Davis album In a Silent Way. This is some of the earliest and most creative Jazz/Fusion and has a universal appeal due to the atmospheric nature of the music. The opening track features John McLaughlin’s guitar playing an immensely pared down version of Joe Zawinul’s tune, which originally had sophisticated harmonies. In fact both tracks eschew normal jazz harmony but have exotic chord movements over a pedal point bass line and have what to me is the most important ingredient – a sense of exploration. It’s as if the music is moving along a jungle path and nobody is quite sure where it’s heading, but the journey is fascinating. This is achieved by Miles and Teo Macero splicing bits of tape together so that the track eventually becomes a direct and triumphant statement, with a searing Davis solo. It’s all a masterful melange of sounds, tape edits, exploratory improvisation – everyone on their toes … magical! Catch some Jazz at Turner Sims soon!